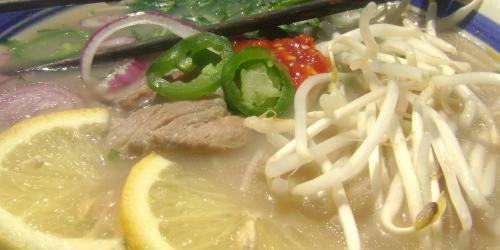 Pho is one of those foods that periodically inspires intense cravings for most people I know. Amazingly flavorful broth with soft-yet-chewy rice noodles, meat and an array of add-ins that contribute an assortment of flavors and textures—you just can’t beat it. And yet, I know few people who actually make it at home, which is strange because it’s so easy and cheap. This recipe will easily feed 2-3 people for less than $12 total. Make sure to buy your ingredients at an Asian specialty grocery store for the best prices and selection. Asian chili sauce or Sriracha $2 for 12 oz. Fill a pot with 3 quarts water. Add coarsely chopped pork, garlic, ginger, lemon grass, brown sugar, salt, pepper, cilantro stems and coarsely-chopped onion. Cover, bring to a boil and then reduce to a simmer. Allow to simmer for 45 minutes and up to two hours. Strain broth, discard solids, and return broth to pot. Bring broth to a boil and add thinly sliced pork and rice vermicelli. Cook until noodles are done and pork is cooked, about 10 minutes. To serve, use a ladle to portion broth into bowls. Use tongs to add noodles and pork to bowls. Serve with cilantro leaves, sliced red onion, lemon wedges, jalapeño, bean sprouts, hoisin sauce and chili sauce or sriracha to add in. But, I’m confused, do you add the pork at the beginning when you make the broth or at the end? oooh, thanks that makes sense! So you want me to throughout 1/2 lb of coarsely chopped pork tenderloin??? This website contain a lot of very amazing recipes collection with complete detail. You can follow this website to learn more about cooking and latest methods and new recipes have this website. I’m happy for my sister to get this site. She love cooking so much. The Bulk Texting is one such programming program. Once downloaded onto your PC, the bulk texting engages you to manage most of your SMS correspondences particularly from your work territory. The item is permitted to acquaint and it empowers you with regulate, send and get individual and bulk SMS correspondences.